Interior Designers can be lucky enough to be paid to publish articles by other companies on their own site. You could get several hundred dollars/pounds a year by doing this without being too detrimental to your readership. If you are good you could then even get asked to paid to write on other blogs…but let’s not get ahead of ourselves! You may well already have been approached several times by annoying emails asking you to host a guest blog post from another company. Most of these you probably ignored. Fair enough, we all do that. However from my experience they are NEARLY ALL genuine. Now, I’m not saying they are genuine MONEY-MAKING opportunities for you! BUT they are at least genuine enquiries. The problem, which if you have responded to any of these emails, is that most essentially want you to host a free advertising-like article for another company. They pretend to be offering you ‘free’ content. Usually such an article is written by an independent blogger or ad agency who is being paid to get content on other websites/blogs. Ones like yours and mine! Yet they want this for free 🙁 [Big unhappy face for that one!] I don’t like using emoticons but 🙁 is DEFINATELY appropriate here. I mean, what a cheek! You may well have spent years building up your blog and readership and now somebody wants to piggy-back on your success FOR FREE. I don’t think so! That’s really very, very (and I’ll say it again VERY) cheeky. So what I do first of all is to try to sort the wheat from the chaff. I reply and send a very short email with MY advertising rate card attached (click on the link to my advertising rate card and you can copy, change and use it yourself). This then gets rid of 80% of the original respondents who really were just looking for a freebie. Maybe there are lots of suckers out there? But what about the remaining 20%? Well they are real, genuine enquiries who WILL pay you some money in return for a post and an image and a back-link. Easy money for you. BUT how much should you charge? And how easy will it really be in terms of the time required by you to either write, edit or publish it? 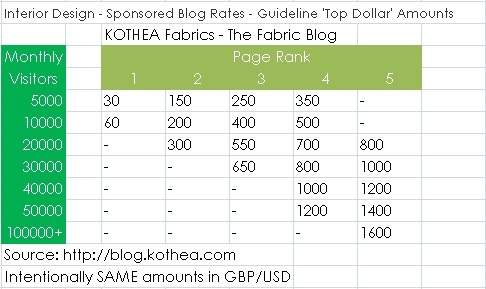 A sponsored blog post is a blog post which you are paid publish on your blog. It may be written by you, an agency or another blogger. Effectively it is an advert pretending to be an article and it will usually contain at least one backlink and one image. To be honest with your readership and to comply with laws in some countries you should include a footer line clearly stating that Company X has sponsored this post. There are many rate cards or charts out there. Most try to come up with a figure of what you should be paid based on some complicated technical algorithm. In the end it will come down to what the buyer/advertiser is willing to pay AND the number of people in the chain of command taking a cut on this ie AT LEAST an agency and a writer and you need to get paid for this. The amount will depend very much on the industry you are in. Let’s look at the interior design industry. Over the years manufacturers (like us, KOTHEA) have paid THOUSANDS of pounds for full page colour ads in House & Gardens, World of Interiors and the like. If you also add in the cost of photographing and producing the image and managing the advertising process then you are talking about a very significant amount of additional cost ie MANY thousands of pounds. In the case of a fabric company, you have to sell a LOT of fabric to break-even on that – probably an amount equivalent to the profit from one of your BEST customers over a whole year. Niche interior design industry manufacturers can’t afford that kind of cost. So they have historically, typically paid for small, ineffective ads on the back pages of the abovementioned publications. Still, these small ads cost hundreds of pounds. So most manufacturers/sellers DO HAVE an advertising budget. That’s the point. The issue with advertising on blogs is that the readership is often MUCH smaller than a renowned international magazine. The readership is potentially no more or less relevant than your readership just that there is more of it. Your blog is potentially attractive, however, because it is impossible to produce true statistics to see who actually saw and remembered those expensive colour ads in the press – whereas you DO have the stats for your followers, subscribers and visitors. KOTHEA’s blog has many hundreds of followers, a blog like DesignMilk has probably got many thousands. Yours might have NO followers. So if that were the only way of valuing a paid-for blog post on your site you would get paid nothing. And I wouldn’t get paid that much! But that clearly is NOT the full story. Your wider readership is MUCH wider than your followers of your blog. It includes the followers on your FB page, your Twitter feed and of course many people will ‘just’ arrive at your blog after a generic internet search. So the overall traffic you receive is also important as is the amount of time and number of pages the average visitor spends on your site as is technical considerations like PAGERANK. The latter of which plays a role in determining the likelihood of someone arriving on your page after a generic Google search. So manufacturers DO HAVE a budget. But it will be spread over many media types and the amount allocated to blogs will also be spread according to the perceived effectiveness of that blog in reaching the manufacturers target audience. And it will be spread over LOTS of blogs. Who is your target audience? Is it other designers or is it potential customers for you or is it people who want to learn about interior design or someone else? None of those are essentially ‘good’ or ‘bad’, just different. Different manufacturers will want to target different kinds of customers. Anyway, what I’m trying to say in this section is that the Interior Design industry does have money to spend on paid for blog adverts BUT that it is at lower levels to that found in other industries (from my experience). So some of the rate cards you see elsewhere are too high for you to achieve…unless you run DesignMilk or one of the blogs with LITERALLY millions (plural) of unique hits a year. I have limited contacts in ad agencies. But I do have some. From what I can gather the ‘top dollar’ rate paid by a advertiser will be US$/GBP1,600. The agency will get broadly half that and you or I would, again, get half of that half. (A quarter for all you maths genius types out there). So you might get US$/GBP400 if you are lucky. I’ve managed GBP200 from M&S on KOTHEA’s site, and larger amounts outside the Interior Design industry. You might be able to get 4 ads a month at GBP/US$50. But then do you want Jo’s Roman Blinds and Petra’s Porcelain Cornicing advertising on your site? They were totally fictitious companies but you get my drift that the companies that pay top-dollar are more likely to be top brands that you want on your site rather than local unknowns. Here are my suggestions on what bloggers should charge for sponsored blog posts. I’m using two metrics here, unique visitors per month and Google PageRank as a measure of authority. You could offer exclusivity to your advertiser for monthly, repeat business. Do you want a low volume, high value approach or a high volume, low value approach? The latter is probably more realistic but probably more detrimental to your image. Do you also post to pinterest? tumblr? Google+? twitter? Facebook? If you have a wider social reach then that will justify a premium. Is the company actually one that might be of interest to who your know your readership to be? Be sure the advertiser will check the effectiveness of their ad. If it was successful they will come back for more. It will only be successful if the message and the audience match. Will you write the post? That is one option where you save the agency some money on copyrighting and so you can charge more. But will the agency trust your writing skills? Will you write/host an ad? Or can it be genuinely meshed in with what you normally write? Again, the latter has more value but the agency might prefer the control they have of the former. Just get started at lower rates and build up a portfolio of ads. You can then use that track record to raise your rates later. Read this article closely and develop a charging structure that genuinely reflects your influence and writing skills. You’ll get found out, or exploited, soon enough. Get paid, then write. In that order. Or ‘take down’ the ad/post if payment is not made within 24 hours (eg to you by paypal). Agencies WILL pay that quickly. Insist that you have final say of the copy of the advertiser writes the copy. I am pushed for time and generally I only accept a sponsored post written by someone else and approved by me. If you have more time then on some occasions you can get paid MORE for writing the copy. Many companies don’t really mind either way as long as what you say is positive AND that you link back to their site. Many of these companies are just paying for glorified back-links to improve their position in Google ranking. More enlightened companies will be looking at building the buzz or conversation around their brand. They will be looking for someone to push their brand to your engaged readership. These enlightened companies are the ones that will pay more but then you might need to deliver more than just an article. So you might additionally agree to post a few links back to your article on forums or on twitter or other sources. When you start writing sponsored blog posts let your readers know what you are doing and why. Be honest. Some advertising agencies will be able to offer you multiple payments for multiple posts. You might want to give a discount for this. Let your client know when the article is published and tell them any extra things you have done such as automatically posting it to Twitter. There are apparently agencies that can direct opportunities towards your site. I only found one (can’t remember it’s name) but I never had any joy with it. It’s fine to use all of this as a side line. Don’t get too carried away as you will end up wasting too much time and diluting your brand. Don’t sell yourself short. Don’t give away things that have a value for nothing. in reality I might not delete it. the phrase just puts a definite end to the deal. It also offers the opportunity to charge an additional fee for a longer period. Really, really useful guidelines – thank you so much. Smashing blog post. You just opened my eyes to many things.